Let's recap the action from Group A & Group B as they played their final matches. Spain came into the game with seven changes which included David Villa and Xabi Alonso playing their last World Cup game for Spain. Australia was missing Cahill due to suspension. Both teams were already eliminated but there was a matter of pride at play. Spain started the game with a real high tempo, completely different from what we had seen from them in the first two matches. David Villa brought a lot of dynamic to the forward line and from the first minute it was obvious he was going to cause problems to the Australian defense. Spain was pressing high, almost near the penalty area of Australia and this was causing problems for the Socceroos to move the ball with any quality out of their defensive zone. 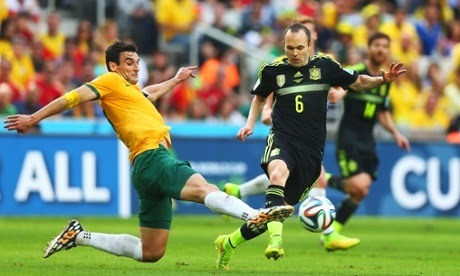 Australia went with long balls to the forward lines which were easy cleared by the Spanish defenders. Missing Cahill and having pressure right outside their box was proving to be a problem for them going forward and creating offensive plays. Spain kept pushing forward and it was a matter of time before they would score a goal. Finally at the 36th minute mark a wonderful pass by Iniesta, that Juan Fran collects on the right hand side near the corner flag. He looks up, dribbles into the box and finds an open Villa that finished with an incredible heel flick, no chances for the keeper. You have to wonder, where was this Spain for the first two matches? Villa and Torres were playing well and Spain was leading and deservedly so. Halftime came with Spain leading 1-0 with a goal from Villa. Second half started just like the first half with complete control of Spain and Australia relegated to their defensive midfield. Spain’s tiki taka was in full display today and it was even more evident during the second half of the game when they passed the ball around the Australian half looking for an opening, so they could add to their lead. In the 57th minute, David Villa was subbed off for Juan Mata and it was his last seconds with the Spanish jersey on. He would later cry on the bench as his World Cup and time playing with Spain has come to an end. Twelve minutes later and it was Iniesta once again with an incredible pass to Torres and from close range he wouldn’t miss. Torres, another Spanish all-time great, scoring a goal in what was Spain’s last game at this year’s World Cup. The game was pretty much over, Australia didn’t have the weapons to fight back and with Spain controlling the ball and play there was no chance for an Australian comeback. Only 13 minutes after the second goal, Fabregas with a great pass to Juan Mata and the Manchester United player puts the ball between the legs of the Australian keeper. It was 3-0 for Spain and the game was sealed and delivered. It was only a matter of running down the clock. The game would come to an end with the final score line of 3-0 for Spain. They finished 3rd in the group with 3 points and Australia finished 4th with 0 points. A very good Spanish side today, that found their form far too late. Needing only a draw to win Group B, the Netherlands disrupted Chile in the final third and effectively hit them on the break as they came out as 2-0 winners. The Dutch, leaning on some physical play that was reminiscent of their infamous performance in the 2010 World Cup Final, never allowed Chile to ever get going in this one. Despite the Chileans enjoying 68% of the possession, they weren't allowed to fully control the tempo of the match and looked susceptible to quick counter attacks. With Chile's Arturo Vidal not in the starting eleven thanks to injury, and Robin van Persie not available to the Dutch thanks to a suspension, there was a distinct lack of quality in the opening exchanges. That eventually changed as the brilliant Alexis Sanchez began to play his way into it and setup a few half chances for Chile. The half concluded though with a few dangerous chances for the Dutch, including an electrifying run from Arjen Robben. Taking the ball just inside Chile's half, he blazed through the Chilean defence before just missing out on a spectacular goal when he shot wide. The physical play continued in the second half as the Chileans tried in vain to get the goal they would need to win the group, as a draw would have been enough for the Dutch. 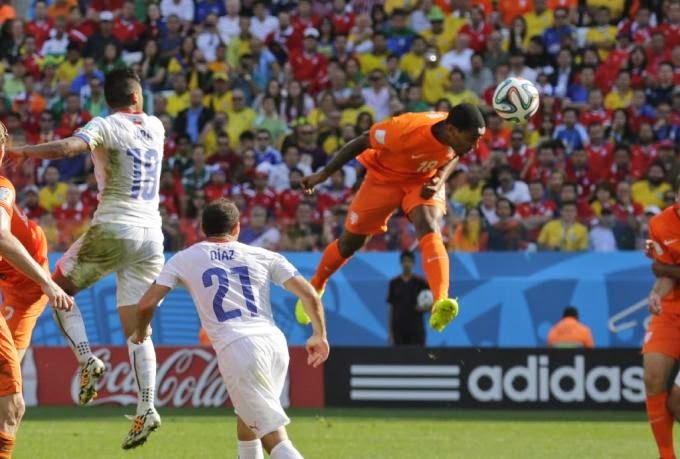 With the Netherlands defence holding strong, the Oranje then took the lead on a great header by Leroy Fer in the 77th minute. With Chile then committed to all out attack, Robben again cut them to pieces on the break but this time was able to find Memphis Depay for a second goal in the 91st minute. By virtue of this result, the Netherlands win the group and Chile will most likely play hosts Brazil in the Round of 16. The scenario going into this match was quite simple for both teams. Considering that it is more than likely that Brazil will be victorious against the dreadful Cameroon, both sides knew exactly what they needed to achieve. For Mexico a draw was enough to qualify to the round of 16, but for Croatia a win was a must. Very early in the match it was obvious that both sides were playing according to what they needed the outcome to be. Mexico was very much unlike the energetic squad we saw against Cameroon, but especially Brazil, and they seemed to be very content to play for the draw, taking very few situations to attack against the Croats. Croatia on the other hand enjoyed most of the possession, playing in the Mexican half for most of the first 45. Mexico did come out of the half with possibly the best scoring chance, hitting the crossbar with a powerful shot. Other than a few long balls into the box, Croatia did not look like a contender for a goal, with the Mexicans defending pretty well and Mexican keeper Ochoa not called into action too often. The second half started almost identically to the first, but this time around the all-around play of both squads started to seem even duller, as both teams were committing numerous passes into “no-men’s land”. In the 65th minute however, controversy, as Mexican Andres Guardado took a half-volley towards the goal from inside the Croatian box that was saved by a Croatian defender with the hand; the referee did not blow the whistle however, and the Mexicans were left in awe from the lack of penalty-kick call. The Croats kept their dull play, seeming to lack the confidence needed to change the match in their favor. In the 71st Mexico got their justice as captain Rafael Marquez met a corner-kick with his head and slotted the first goal of the match past goalkeeper Stipe Pletikosa. The Croats seemed to lose their concentration and just 5 minutes later a counter attack for the Mexicans ended at the feet of Guardado who put the second in the back of Pletikosa’s net with a first time shot. In the 78th minute it looked like Croatia would get one back after a quick attack and a shot that beat keeper Ochoa, but Mexican defender managed to clear it almost from the goal-line. And then the “nail in the coffin” as Javier Hernandez (Chicharito) took advantage of a corner-kick ball that first went off of Marquez’s head, to put his own head onto the ball and put it in the net. After the third goal the Mexicans were now obviously chasing more with a few more dangerous attacks after going up 3-0, trying to make sure of a greater goal advantage than that of the Brazilians who were playing Cameroon at the same time. But the Croats would not let that happen, scoring in the 87th after a good passing combination. In the 88th Croatia would go down to 10 man after a dangerous challenge by Ante Rebic on Mexican Carlos Pena. Before the final whistle, Mexican goalkeeper Ochoa got called into action one last time as he made a good save on a close range volley (although it was judged to be offside by the lines-man). Mexico win puts them through to the next round (the round of 16) where they will meet the Dutch. first 10 minutes of the game, saw a strong Brazil pressuring up field and creating many chances of goal. If not for some bad luck and some saves from Itandje, they could have scored in the first couple of minutes. You could tell that Cameroon wouldn’t be able to keep them out of the score sheet for too long and at 17th minute, a mistake from Cameroon in the midfield, Luiz Gustavo gets the ball, runs down the wing and has a wonderful cross for a wide open Neymar that just had to tap it in. 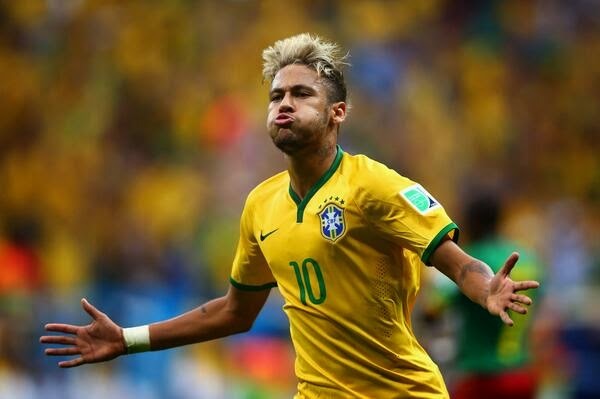 Brazil was finally up 1-0 and it looked like they were going to have an easy match. Cameroon had other plans, and after going down one goal they seemed to bounce back and started to go forward looking for their own goal. They had a few chances but Silva, Luiz and Cesar were able to clear any danger that came their way. That was until the 26th minute when Nyom wins a lucky bounce off Dani Alves and crosses the ball into the box where Matip shows up unmarked and just having to push it in the net. The stadium was silenced and Cameroon had pulled the game leveled. Brazil didn’t put their heads down and kept passing the ball between each other, trying to find space in the wings and even David Luiz was moving the ball forward trying to create an odd man rush that would cause Cameroon problems. Only 10 minutes had passed since Cameroon tied the game, and a pass from Marcelo to Neymar, who drifts to the middle and while dribbling takes a shot on net to give Brazil the 2-1 lead in the game. The ball went between a defenders legs and Itandje could have done better to stop that shot. Brazil deserved the lead at this point and was looking at keeping it going into halftime. The last 10 minutes of the half were played in Cameroon’s half with Brazil controlling possession and the ball, waiting for a mistake or the time to run out, whatever came first. Second half had barely started and Brazilian fans were already celebrating another goal. Fred is this time the goal scorer with a well-placed header. He had been searching for his opening goal in the competition for 3 games now, and in the last game of the group stages he finally gets his goal. At this point it is game over for Cameroon; they just don’t have the pieces to mount a comeback. Brazil starts to circulate the ball, holding possession and trying to pick their spots. The odd time Cameroon gets the ball they are unable to string a few passes together and lose the ball to Brazil that is very quick on the counter attack, and this is how the fourth goal comes about. Cameroon loses the ball right outside their penalty area; Oscar gets the ball back and combines a string of passes with Fernandinho, that finishes with a wonderful toe punt. No chances for Itandje on this one, his defenders had let him down. A few minutes later and it was the end of the game. Brazil wins 4-1 and guarantees their first place in Group A.
Kon picked every outcome correct and even got the result for Spain vs Australia right. Pedro and Iain both had two correct predictions, but could not secure any exact score guesses correctly. There is no doubt who was the “Staff Picks” victor on day 12 of competition.